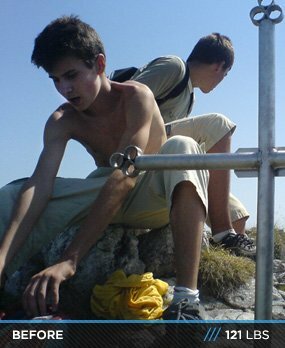 Petier was a prototypical skinny guy, bullied and discarded. Bodybuilding helped him grow into a bold body. See how he gained 40 pounds of hulk! I was the typical skinny boy in the neighborhood, the easiest target to pick on and make fun of. This was my main reason to step into a gym, not with the mentality to overcome my "enemies" but just to become an average Joe and simply blend in. In that period when I thought of doing something about it I heard that a gym had opened 5 minutes from my block, and I asked one of my best friends if he wanted to start this with me. We found that this gym was full of big guys and we had nothing to do there, just to make fools out of ourselves. Two more months passed until we finally found the motivation to really pack our backpacks and join a gym. If you had asked me back then what my goal was I would have answered to get bigger (~20 pounds of muscle) by summer (6 months off) … and that's all. I had no idea that this was going to be for me the journey of a lifetime. I remember that on the first day I stepped into the gym that I was immediately hooked. The first exercise that the trainer (who was a really nice guy, thanks to him I started to enjoy working out) showed us was the dumbbell bench press and the weights were the plastic ones filled with sand. When we saw that, we found it kind of offensive and I lay on the bench and hastily grabbed the 20-pound dumbbells. It turned out that my first day of training could have been my last. I came close to dislocating my shoulder and from that day I learned that it was going to be a long road for me in achieving my goal. In the first 2 years I had no knowledge about nutrition. I never thought about food much and how it can get so complicated, so basically I was in/out of the gym and that was the extent of my bodybuilding. 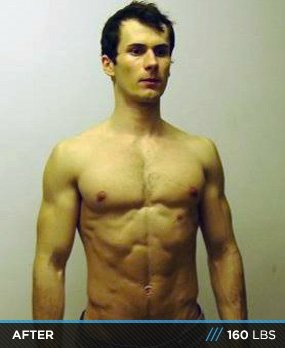 BodySpace opened Pieter's eyes, let him know how little he knew! My whole universe in bodybuilding was between those four walls and I was beginning to be a king, until I found JIsaiahE's profile on Bodybuilding.com by accident one night in a search for plank push-ups. Until then I had no idea that there was a bodybuilding community like that, and by the end of my first hour spent on Bodybuilding.com I was a NEW man. I did not know where to start as I was just devastated by all that new information by the people there. Imagine if you put a cub in a basement and let it stay there until he grows up and then you let it out into the wild; that was how I felt that night, AMAZING. From that moment on my real transformation started as I built my knowledge in nutrition, training, and everything else there is to learn, and to this day I'm still learning. I have a lifetime in front of me to do that and Bodybuilding.com helped me a lot. I started to get motivation from Rolsey, ChickenTuna, Naturalgraham4, and KizMVP (I voted for him to be a spokesman for the website and after all he's hard work he finally achieved that goal). I want to say it's amazing to get in touch with real people from all around the world and share experience, see their progress, get inspired and inspire others further. Now since 2012 started I'm into bodybuilding 100%. It's everything for me, and I know I will do this for the rest of my life. The hunger for becoming better and better is bigger than me, and I have nothing to do about it. I use few supplements due to budgetary constraints, but I can say that BCAAs and L-glutamine are good, especially if your trainings are in high intensity. I train 1-2 hours after meals #2 or #3, and I immediately eat meals #3 or #4 after my workout. Exactly before I get into the gym I have 1 banana and after I have 1 fruit (apple, banana, etc). In between meals I eat fruits (apple, grapefuit, orange - it also depends on the season but these are the main ones), drink green tea (about 1 L a day). I drink around 1.5 gallons of water every day. I also eat almonds, walnuts, peanuts when I feel the need for something salty. Depending on what my budget will be I change the protein source in meals with tuna, trout up to 5 meals a week, or beef (rarely). I switch up my carbs with rice or pasta depending on how I feel and the amount of work I'm willing to put in that day. For example, my third meal today is chicken breast, cauliflower, broccoli, and olive oil. I also consume 1 tbsp olive oil each meal but only when I feel like I need additional fats. I'm constantly changing my routine. I like to confuse the muscle because of its memory and ability to adjust, but I'm always killing each group because the training that you'll miss today will never come back. Give your best in that 1 hour a day no matter what. I do cardio 3-6 times a week, depending on how I feel and what my goal is. I do both HIIT and steady-state cardio, again depends on how I feel and what my goals are. If I want to spare muscles I'll do HIIT, if I feel like jogging that's what I do. I also try to do a 3-5 hour hiking every week (Sunday) and swim once per week. I get into the gym and do whatever I feel like; of course I'm aware of DOMS. If you're looking for a change in your life or just an extra activity, bodybuilding is the one to choose. It's one of the hardest sports I've ever tried, but if you manage to master it I guarantee you'll become a whole new person. It's not just about how you look it's about what's inside, don't blame your genetics and don't let others tell you what you can or cannot do. And if you've already started on this road, all I can tell you is read, learn, put into practice, and once you've done this be consistent, week after week, month after month, year after year. RESULTS WILL COME, only time will tell when, all you have to do is NEVER QUIT.